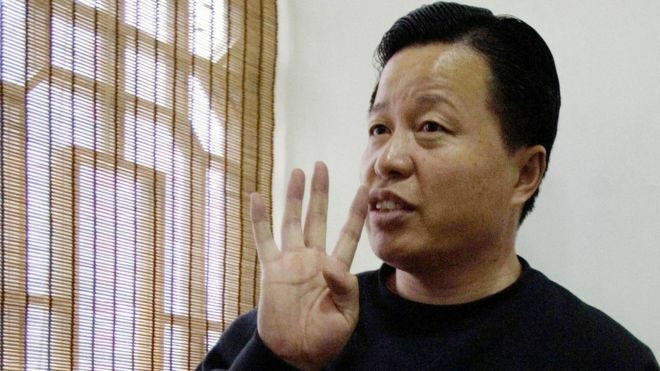 Prominent Chinese dissident and human rights lawyer Gao Zhisheng has broken his silence to describe how he was allegedly tortured and kept in solitary confinement while in detention. The 51-year-old lawyer was released from prison in August 2014. At the time, his lawyer described Mr Gao, a Nobel Peace Prize nominee, as emotionless, “basically unintelligible” and missing teeth due to malnutrition. Mr Gao was speaking to AP, in his first interview in five years. He said he was tortured with an electric baton to his face and spent three years in solitary confinement. Mr Gao is known for defending members of the Falun Gong movement and Chinese Christians. “Every time we emerge from the prison alive, it is a defeat for our opponents,” he told the Associated Press from his home in Shaanxi province. Mr Gao, whose wife and children live in the US, also said he would never seek exile abroad. He described staying in China as a “mission” given to him from God. Mr Gao was convicted of subversion and placed under house arrest in 2006, during which time he claims to have been regularly detained and tortured. He disappeared in January 2009 before reappearing in March 2010. He disappeared again soon after and was revealed to be in a Xinjiang prison in January 2012 after state media said he was being jailed for three years for probation abuse. Mr Gao said that propaganda was broadcast via a loudspeaker in his prison cell for 68 continuous weeks. The Chinese government is yet to respond to the interview and has not responded to other allegations of torture previously made by Mr Gao. Mr Gao’s wife, Geng He, has said that she hopes her husband’s case will be raised during talks this week between US President Barack Obama and Chinese President Xi Jinping in Washington. This entry was posted in Headlines, Writers in Prison and tagged Gao Zhisheng, Human Rights Lawyer. Bookmark the permalink.